This city centre hotel blends Irish charm with a classic atmosphere in the heart of Midtown Manhattan. It comprises a total of 91 guest rooms and suites which provide guests with comfortable base. Facilities on offer to guests at this air-conditioned establishment include a lobby area with a 24-hour reception with hotel safe, and a bar and a restaurant. 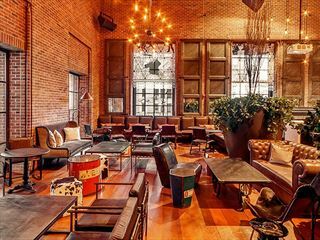 The location is perfect for getting out and about to explore all the sights and sounds of the Big Apple. This luxury hotel is located in Midtown Manhattan, meaning you won't be far from the city's iconic attractions and incredible shops. Deluxe Suites - Just like before, with more space and an inviting sitting area. Presidential Suites - Spacious and luxurious, these suites have elegant furnishings and a separate living room. The Fitz - A trendy and modern take on an Irish bar, offering a cool atmosphere, a delicious blend of Irish classics and New York favourites, and a wicked drinks menu.